Do all “analysts” use Excel? We were wondering how common spreadsheets are as a platform for data analysis. It’s not something I’ve really thought about in a while; I find it way easier to clean numbers with real programming languages. But we suspected that virtually everyone else used spreadsheets, and specifically Excel Spreadsheet, so we did a couple of things to check that. First, I looked for job postings for “analyst” jobs. I specifically looked in companies that provide tools or analysis for social media stuff. For each posting, I marked whether the posting require knowledge of Excel. They all did. And not only did they require knowledge of Excel, they required “Excellent computer skills, especially with Excel”, “Advanced Excel skills a must”, and so on. I generally felt that Excel was presented as the most important skill for each particular job. 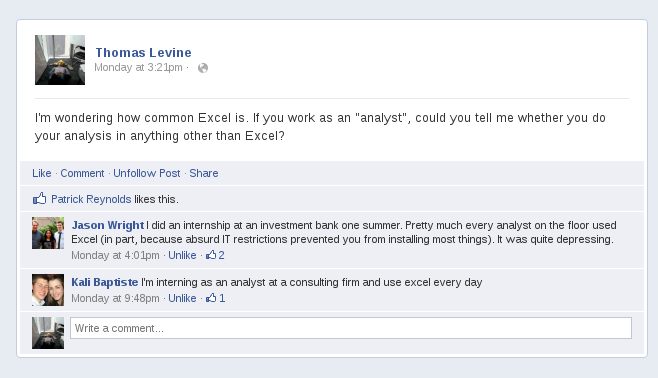 Second, I posted on Facebook to ask “analyst” friends whether they use anything other than Excel. It seems that they don’t. It seems that Excel is a lot more common than I’d realized. Moreover, it seems that “analyst” is basically synonmous with “person who uses Excel”. Having investigated this and concluded that “analyst” is synonymous with “person who uses Excel”, I personally am going to stop saying that I “analyze” data because I don’t want people to think that I use Excel. But now I need another word that explains that I can do more advanced things. Maybe that’s why people invented that nonsense role “data scientist”, which I apparently am. Actually, Dragon thought we should define “big data” as “data that you can’t analyze in Excel”. For ScraperWiki as a whole, this analysis data science gives us an idea of the technical expertise to expect of people with particular job roles. We’ve recognized that the current platform expects that people are comfortable programming, so we’re working on something simpler. We pondered making Excel plugins for social media analysis functions, but now we think that that will be far too complicated for the sort of people who could use them, so we’re thinking about ways of making the interface even simpler without being overly constrained. Any thoughts along the lines of ifttt? Or an ‘app inventor’ style front end? Well impressed with the stability of Scraperwiki at the moment. “Analyst” is used for a lot of government jobs that don’t have a straightforward word to describe them. Apart from this phenomenon, the word is reasonably legitimately used for financial analysts (I think this is what your Facebook friends seemed to be talking about) as well as intelligence analysts and “business analysts” (translate real-world problems into specs for programmers). So the word “analyst” is pretty flexible. IT department won’t give me any programming environments. So a I use Excel VBA. What’s wrong with Excel if it already has VBA? It’s not the most elegant programming language, but a programming language nonetheless.